The millions of punched cards created for the population counted in the national census could then be sorted on the basis of specific bits of information they contained—thereby providing a quantified portrait of the nation and its citizens. In 1910, the German licensee Willy Heidinger established the Deutsche Hollerith Maschinen Gesellschaft (German Hollerith Machine Corporation), known by the acronym „Dehomag.” The next year, Hollerith sold his American business to industrialist Charles Flint (1850–1934) for $1.41 million ($34 million in 2012 dollars). The counting machine operation was made part of a new conglomerate called the Computing-Tabulating-Recording Company (CTR). Flint chose Thomas J. Watson (1874–1956), the star salesman of the National Cash Register Corporation, to head the new operation. The German licensee Dehomag later became a direct subsidiary of the American corporation CTR. In 1924, Watson assumed the role of Chief Executive Officer of CTR and renamed the company International Business Machines (IBM). Black details the ongoing business relationship between Watson’s IBM and the emerging German regime headed by Adolf Hitler and his National Socialist German Workers Party (NSDAP). Hitler came to power in January 1933; on March 20 of that same year he established a concentration camp for political prisoners in the Bavarian town of Dachau, just outside the city of Munich. Repression against political opponents and the country’s substantial ethnic Jewish population began at once. By April 1933, some 60,000 had been imprisoned. Business relations between IBM and the Hitler regime continued uninterrupted in the face of broad international calls for an economic boycott. Indeed, Willy Heidinger, who remained in control of Dehomag, the 90%-owned German subsidiary of IBM, was an enthusiastic supporter of the Hitler regime. Black also asserts that a „secret deal” was made between Heidinger and Watson during the latter’s visit to Germany which allowed Dehomag commercial powers outside of Germany, enabling the „now Nazified” company to „circumvent and supplant” various national subsidiaries and licensees by „soliciting and delivering punch card solution technology directly to IBM customers in those territories.” As a result, Nazi Germany soon became the second most important customer of IBM after the lucrative US market, Black notes. The 1933 census, with design help and tabulation services provided by IBM through its German subsidiary, proved to be pivotal to the Nazis in their efforts to identify, isolate, and ultimately destroy the country’s Jewish minority. Machine-tabulated census data greatly expanded the estimated number of Jews in Germany by identifying individuals with only one or a few Jewish ancestors. Previous estimates of 400,000 to 600,000 were abandoned for a new estimate of 2 million Jews in the nation of 65 million. Investigative journalist Edwin Black talks about the new expanded edition of his best selling book „IBM and the Holocaust.” The presentation took place on February 26, 2012 at Yeshiva University in Manhattan. More information at http://www.edwinblack.com. Many U.S. companies did business with Hitler, including Henry Ford, the Rockefellers etc. The US Airforce bombed a Ford factory in Germany, Ford sued and the US paid them. Why didn’t the United states authorities intercept this illegal business with IBM? For much the same reason (which is unclear) that they didn’t stop Standard Oil, General Motors, and Ford from colluding with the Nazis. What group(s) helped the Communists for some 70 years? Hollywood? Mass Media? Major colleges and academics? An interesting story not yet published. Why? What the video proves is that IBM technology allowed Germany to inventory the skills of workers interned in the work camps. There is no proof in this video of use of the IBM techolog for an industrial genocide, thus, the title is misleading. Edwin Black is an American syndicated columnist and journalist. He specializes in human rights, the historical interplay between economics and politics in the Middle East, petroleum policy, the abuses practiced by corporations, and the financial underpinnings of Nazi Germany. The Transfer Agreement: The Dramatic Story of the Pact Between the Third Reich and Jewish Palestine is a historic book written by author Edwin Black, documenting the transfer agreement („Haavara Agreement” in Hebrew) between Zionist organizations and Nazi Germany to transfer a number of Jews and their assets to Palestine. This agreement was partly inspired by a global boycott of Germany that had appeared to threaten the Reich. Controversial as it may be seen in hindsight, it marked one of the few rescue of Jews and their assets during the Holocaust. This book documents the agreement between Nazi Germany and an organization of German Zionists in 1933 to salvage the smallest amounts of German Jewish assets and the voluntary emigration of German Jews to Palestine before the Third Reich implemented confiscation, expulsion and then extermination. The Transfer Agreement rescued some 60,000 German Jews. A sweeping, worldwide economic boycott of Germany by Jews helped spur a deal between the Nazis and Zionists. At that time, there were few Jews in Palestine, but from 1933 through 1936, 60,000 German Jews immigrated into the region, bringing with them a portion of the assets they once held in Germany. 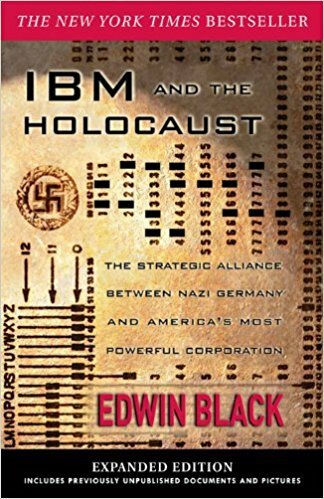 IBM and the Holocaust: The Strategic Alliance between Nazi Germany and America’s Most Powerful Corporation is a book by investigative journalist Edwin Black which details the business dealings of the American-based multinational corporation International Business Machines (IBM) and its German and other European subsidiaries with the government of Adolf Hitler during the 1930s and the years of World War II. In the book, Black outlines the way in which IBM’s technology helped facilitate Nazi genocide through generation and tabulation of punch cards based upon national census data. This entry was posted in Dzieje, Genetyka, Nauka o człowieku, Stara nauka, Tradycje i kultury, Tłumaczenia, Zakazana Wiedza, Ściemy na masę, Życzenia pobożne and tagged #GermanDeathCamps, #JewishCollaborationWithNaziGermany, #JewishNaziCollaborators, #PolishHolocaust, #PolishHolokaust, 13 Leszno, 13 Leszno Street in Warsaw, 25 August 1933, Abraham Gancwajch, Adam Czerniakow, Adolf Hitler, Adolf Hitler – Founder of Israel: Israel in War – With Jews, agreement between Nazi Germany and Zionist German Jews, Anglo-Palestine Bank, Ans van Dijk, ANTI-SEMITISM BY POLITICAL ZIONISM, Auschwitz, ‎ Rachel Neiman, Bernard Goldstein, Birkenau, British Mandatory Palestine, Central Office of the Jewish Council of Elders in East Upper Silesia, Chaim Rumkowski, Chełmno extermination camp, Collaboration with Occupying Forces and Genocide in the Second Republic 1918-1947, Computing-Tabulating-Recording Company, David Gutter, David M. Crowe, Dehomag, denial, Deutsche Hollerith Maschinen Gesellschaft, double ethics, double morality, double standards, Edwin Black, Eichmann in Jerusalem, Eliezer Hoofein, Elsa Trank, Else Tarnek, Enemies Within Our Camp- The Trial of a Kapo, Five Years in the Warsaw Ghetto: The Stars Bear Witness, Genocide, German, German Gestapo, German Hollerith Machine Corporation, German invasion of Poland in September 1939, German Jewish, German National People's Party, German occupied territories, ghettos in Nazi-occupied Europe, Give Me Your Children, Gomberg map, Greatest Hoax Ever Perpetrated On The Jewish People, Gross-Rosen concentration camp, Gross-Rosen concentration camp in Germany, Group 13, Group Thirteen, Guttman Shmuel Landau, Haaretz, Haavara Agreement, Hannah Arendt, Hanotea, Hashomer Hatzair, Hennecke Kardel, HItler, Holocaust, Holocaust Industry, Holocaust scholar, http://jewishcrimes.info, http://www.jewsnotzionists.org, https://www.haaretz.com, Hungary, IBM and the Holocaust, IBM and the Holocaust: The Strategic Alliance Between Nazi Germany and America's Most Powerful Corporation, IBM in America, Ignacy Diamond, II World War, International Business Machines, Itamar Levin, Jacob Gens, Jakub Lejkin, Józef Andrzej Szeryński, Jewish Agency, Jewish Aid and Rescue Committee in Budapest, Jewish collaboration with Nazis Germany, Jewish collaboration with Nazis Germany during II World War, Jewish Community of Vienna, Jewish council, Jewish ethics, Jewish Gestapo, Jewish Ghetto Police, Jewish ghettos in German-occupied Poland, Jewish Holocaust Amnesia, Jewish honor, Jewish kapos, Jewish Nazi collaborators, Jewish self-agency, Jewish Sonderkommando, Jews Accusing Jews, Jews Against Zionism, Jews were put on trial in Israel for aiding the Nazis, Josef Löwenherz, Josef Szynkman, Judenrat, Kapo on Allenby, kapos, Katarzyna Person, Kurt Becher, Leon Rosenblatt, Litzmannstadt, Litzmannstadt Ghetto, Man’s Search for Meaning, Marcel Zellinger, Mordechai Chaim Rumkowski, Mordechai Goldstein, Moshe Merin, Moshe Pochich, National Socialist German Workers Party, Nazi and Nazi Collaborators (Punishment) Law, Nazi and Nazi Collaborators Law, Nazi collaborator in the Warsaw Ghetto, Nazi concentration camps for Poles in Silesia, Nazi German administration, Nazi-imposed Jewish councils, Nazi-imposed Judenrat, Norman G. Finkelstein, NSDAP, Ofer Aderet, One cow in Palestine is worth more than all the Jews in Europe, One cow in Palestine is worth more than all the Jews in Poland, Oskar Schindler: The Untold Account of His Life Wartime Activities and the True Story Behind the List, Ostrovitz ghetto, Palästina Treuhandstelle, Poland, Poland’s Holocaust: Ethnic Strife, Poles, Polish citizens, Primo Levi, Rabbi Weissmandel, Restoring ‘Jewish honor’, Revisionist Zionist, Reya Hanes, Rudolf Kastner, Schindler’s Ark, Schindler’s List, Shoah, smuggling furs out of the Warsaw Ghetto, Sonderkommando, Stella Kubler, Symche Spira, Szlojme Hercberg, Szymon Spitz, Tadeusz Piotrowski, Talmudic ethics, The Drowned and the Saved, The Holocaust Industry: Reflections on the Exploitation of Jewish Suffering, The Nazi collaborator who served ice cream in Tel Aviv, The Transfer Agreement, The Trust and Transfer Office "Haavara" Ltd, Thomas Keneally, Tzvi Yaakovson, Viktor Frankl, Vladimir Jabotinsky, Walls Around: The Plunder of Warsaw Jewry during World War II and Its Aftermath, Warsaw Ghetto, Wehrmacht, Weronika Grynberg, Wiera Gran Vera, Willy Heidinger, Wladyslaw Szpilman, World War II, World Zionist Congress, Yaakov Honigman, Yechezkel Ingster, Yehezkel Ingster, Yitzchak Gruenbaum, Ze'ev Jabotinsky, Zentrale der Jüdische Ältestenräte Ostoberschlesien, Zionism, Zionism And Anti-Semitism, Zionist Federation of Germany by SKRiBHa. Bookmark the permalink. FAIR USE NOTICE: This video may contain copyrighted material. Such material is made available for educational purposes only. This constitutes a ‚fair use’ of any such copyrighted material as provided for in Title 17 U.S.C. section 106A-117 of the U.S. Copyright Law. Program opowiada o tym, jak za pomocą potęgi symboli, znakomitej inżynierii i podstępnej propagandy nazistom udało się przekonać zwykłych Niemców do podążania za Hitlerem. 1) NSDAP wraz z Hitlerem doszło do władzy nie dzięki NAZISTOM, tylko dzięki ZWYKŁYM NIEMCOM, którzy wybrali Hitlera na kanclerza i tym samym zgodzili się na jego politykę. Więc CAŁY NARÓD NIEMIECKI ( przynajmniej ci co na Hitlera głosowali ) są winni rozpętania II WŚ. Niestety film -KRAJOBRAZ PO HITLERZE- komuś przeszkadzał bo dostałem roszczenie o naruszeniu i propagowaniu przemocy. Niestety film również zablokowali w PL. Napisałem odwołanie, Ale nie wiem czy przywrócą. SYSTEM !! Zostaw Suba !! i Łapkę w górę to bardzo motywuje. Dziękuje. 26 maja 1938 rok. Hitler kładzie kamień węgielny pod budowę fabryki Volkswagena. Wizję tak zwanego „samochodu dla ludu” realizuje wspaniały projektant, Ferdinand Porsche.